Catoctin Creek Distilling, located in Purcellville, VA, is run by Scott and Becky Harris, who opened their distillery in late 2009 and started production last year. Beginning with their initial run, the majority of the distillery’s products (but not all) — which include both an unaged rye whiskey and a briefly-aged rye whiskey — have been made under the supervision of “Star-K” Kosher Certification. The Catoctin kosher-certified products include: Catoctin Creek Organic Mosby's Spirit, Catoctin Creek Organic Roundstone Rye Whisky, Catoctin Creek Organic Watershed Gin, and Catoctin Creek Pearousia Pear Brandy, all of which bear the “Star-K” logo. One of the most interesting is Catoctin Creek’s Roundstone Rye. This smooth, tawny colored rye is aged for a few months in new white oak barrels. It has flavors and aromas of vanilla, oak, caramel, lemon, and allspice. A pleasant sipping whiskey, Roundstone Rye is also a good choice for use in bitters-driven cocktails, such as the Old Fashioned. Catoctin Creek Organic Mosby's Spirit is a multiple award winning, delicious rye "white whisky", with a velvety smooth, sweet and undeniably pleasing cereal taste with floral notes and citrus. The secret — it is unaged Roundstone Rye whiskey. By the way, John S. Mosby was a Civil War colonel. Catoctin Creek Watershed Gin pays tribute to the Chesapeake Bay watershed, into which Catoctin Creek flows. Distilled from organic rye grain, with a secret recipe of organic herbs and spices, it is unlike any gin you've tried — amazingly complex, with a rye base that shines through subtle citrus and cinnamon notes. Another newcomer to kosher is Chicago’s Koval Distillery, run by Robert and Sonat Birnicker, the first legal whiskey distilled in Chicago since Prohibition. Their products are unaged or aged less than two years, and all are “OU”-certified. Koval produces white whiskeys, liqueurs and specialty spirits. The grains used include wheat, oat, rye, spelt, millet, ginger, rose, chrysanthemum, coffee, orange blossoms and jasmine. Koval’s Chicago Whiskey is an 80 proof unaged rye, best served chilled or over ice. One of the most enjoyable is Koval’s Lion’s Pride Dark Millet Whiskey. It is made from 100 percent organically grown millet. Medium bodied, this whiskey is aged in charred white oak barrels. Lion’s Pride is available in rye, oat, wheat, spelt or millet and is available in two aging styles — light char and dark char. Lion’s Pride is often used in cocktails with a bit of citrus. San Francisco-based Distillery No. 209 is the maker of the only Kosher-For-Passover Gin (“OU”-certified). No. 209 is a popular gin, but is not kosher-certified. No. 209 Kosher-For-Passover is identified only by the “OU-P” logo prominently displayed on the bottle. Making gin for Passover is challenging. By law, juniper is the dominant flavor in gin, but No. 209 Kosher-For-Passover requires nearly a dozen botanicals to create its unique flavor. It uses bergamot orange from Calabria, California bay leaf, lemon peel from Spain, cassia bark from Indonesia, angelica root from the UK, and coriander seeds from Romania. Regular No. 209, not kosher-certified, uses cardamom, which the above list of botanicals replaces. Moses Vodka is certified by the “OU” as Kosher-For-Passover (“OU-P”). Not only that, the entire process is under some of the world’s leading kashrus authorities: Rabbi Osher Yaakov Westheim, head of the Badatz Igud Rabbonim, supervises the distilling process; Rabbi Dr. Moshe Edelmann, Head Rabbi of the Jewish Community of Finland, and Rabbi Benyumin Gruber of Monsey, NY are responsible for the quality of the ingredients and the production process. Many whiskey consumers relish the fruit of industry innovation — infused flavors, like cherry and honey, and the new finishes from port barrels. But, for the kosher consumer, these “advances” represent a major change in the arena of alcoholic beverages, a real “game changer”. 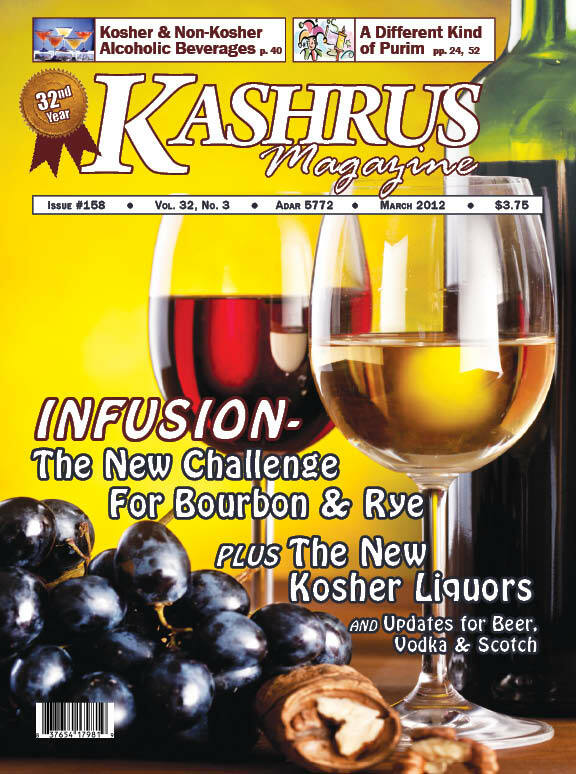 Many kosher consumers are now seeking kosher-certified alcoholic beverages rather than relying on the imperfect system of the “kosher grapevine”. Indeed, at a recent meeting of AKO (Association of Kashrus Organizations) the kosher agencies embraced a stricter policy vis-à-vis alcoholic beverages. In April, Jack Daniel’s Tennessee Whiskey rolled out Tennessee Honey, a 70-proof proprietary honey liqueur blended with Old No. 7 Jack Daniel’s Whiskey. To the untrained, this appears to be Jack Daniel’s, a whiskey. But, in fact, it is a liqueur and very much requires kosher certification, which it does not have. In just a few months dollar and volume sales for Tennessee Honey exceeded all of its flavored peers combined (Wild Turkey American Honey, Red Stag and Evan Williams Honey and Cherry), reported Vivien N. Azer, an analyst at Citi Investment Research. Jim Beam introduced Red Stag Black Cherry Bourbon in 2009, which broadened the bourbon market to include even those who are normally not bourbon drinkers. Beam will soon add two flavors to the line: Red Stag Spiced and Red Stag Honey Tea. But these flavored bourbons are not as innocuous as a pure bourbon, and should remain “hands off” for the present time. In April, Louisville Distillery Company introduced Angel’s Envy, a Kentucky straight bourbon whiskey aged for at least four years and then transferred into used port barrels [wine casks] for four to six months for a port barrel finish. Many consider a liquor aged in port or sherry casks to be halachicly prohibited. Until today, many consider beer innocuous, although some are limiting themselves to kosher-certified varieties due to the following issues. The processes for brewing, distilling, and aging beer is changing rapidly. There is a growing demand these days for sweeter, more flavorful and more exotic-sounding drinks. Craft breweries and small distilleries are flooding the market with specialty blends and new ingredients. Craft beer is the fastest growing segment of the spirits industry. We now have beer that tastes like pizza because it actually contains mashed up pizza, bacon beer with real bacon fat flavoring, oyster beer with real oysters brewed right in. Lactose sugar (dairy) is used in the making of some beers. Full Sail Brewing Company, since 1996, has been aging their beer in bourbon barrels. Top Sail Bourbon Barrel Aged Imperial Porter is a blend of three barrel varieties. The Full Sail company was advised by Macallan to use these barrels. Macallan is the first known maker of a single malt aged in sherry casks. So far, it is bourbon barrels that are being used. The first beer company to use sherry casks will claim a special taste, unique among the others. Barnivore.com is a website geared to the vegans who will refrain from any beer that contains ingredients derived from animal sources. They list a goodly number of beers to avoid due to the use of certain agents (not ingredients) in the making of beer. At the present time, it is the opinion of most kashrus agencies in this country to continue to allow domestic beers without kosher certification. That is referring to the challenges of filtering agents and other non-kosher items in the production of beer (which do not appear on the label). However, the use of wine casks for beer making could be considered unacceptable to most, if not all, kashrus agencies. Today, Vodka can be made from wine or be infused with wine, or it can be dairy. Non-flavored vodka made in this country is considered acceptable, but watch the label carefully. Avoid the words grapes, wine, milk, whey, and lactose. Idol Vodka is made from Pinot Noir and Chardonnay grapes from Burgundy, France. Ciroc “Snap Frost” Vodka is made from Mauzac Blanc grapes from the Gaillic region of France and Ugni Blanc grapes from the Cognac region of France. These vodkas are not kosher. Scotch is increasingly being aged in wine casks. Some kosher consumers have started to look for kosher certification while others rely on reading the label. If there is no claim to having used sherry or port wine casks for the scotch they will imbibe. However, today’s language describing the use of wine casks is a bit more broad. Consumers wishing to avoid scotch aged in wine casks should look for the following on the bottle: double or triple finish, double or triple maturation, dual casks or finish, European finish, French finish, Madeira finish, or the use of the words port, sherry, sauterne, or cognac. On the surface, it seemed that a match between these two families had been inevitable, the very universe having held its breath until we both came of age. Of course, married life taught me that “the surface” is but a shallow skin, and the differences that lie beneath can be vast and significant, though not perceived by the human eye. This fact was brought home to me in a very real way during my first Purim as a married woman. Since we had chosen to settle in my husband’s hometown after our marriage, a mere two months prior, it went without saying that we would be joining my in-laws for the Purim seudah. If I would have known then what I know now, I probably would have booked the first flight home. Of course, I was in carefree newlywed oblivion, assuming that this Purim would be identical to all those I’d celebrated in my parents’ home, albeit with different people and at a different address. My first clue should have been the amount of alcohol my husband purchased at his father’s request (with his father’s credit card) in advance of that holy day. I must have just assumed that my in-laws gave a bottle of wine in their Mishloach Manos to each recipient. And they know hundreds of people. And so, with blissful naiveté, I walked up the steps to my in-laws’ home early Purim afternoon, my slightly tipsy husband at my side. Allow me to digress for a moment and describe to you my parents’ Purim seudah, where I’d spent every single Purim of my life thus far. My father took a brief nap around noon time, following the opinion that by sleeping one fulfills the obligation of “Ad Delo Yodah”. After he woke up and davened Minchah, he sat down at his designated seat at the head of our long dining room table, where he held court until Purim was over. He sat with a sefer open in front of him, swaying gently and murmuring the words, oblivious to his surroundings. Slowly, the visitors, mostly students past and present, started streaming in. My father would gently kiss his sefer, and greet each one with a warm handshake and a broad smile. They would sit down next to him, share a few words of Torah, receive a heartfelt bracha, and then linger for some cake and soda before slipping quietly out the door. At any point when there was a sizeable group present, they would break out in song for a few minutes, clapping and swaying, but always sitting. Drunken groups who attempted to enter our home to collect for their worthy causes were quietly intercepted before they were able to cross the threshold, handed a few dollars and sent on their merry way. At some point my father would come to the kitchen to wash, and then sit back down at his place, surrounded by his sons and talmidim. My mother would serve him and his current guests her specialty sweet and sour chicken, roasted potatoes and garlic green beans. He only ate chicken she koshered and very specific produce and brands. All other products never entered our home. We girls ate in the kitchen where we had a clear view of all the proceedings, which we watched in reverent silence. My father was the undisputed king on that day, and the entire atmosphere in our home was nothing short of regal. There was rejoicing and liveliness, but there was no frivolity and no raucousness, and of course, there was not a single drop of alcohol to be found in my father’s home on Purim. That was how my parents celebrated Purim; in refined, dignified joy, and that was the only way I knew how to celebrate Purim, the only way I wanted to celebrate Purim. Fast forward now to the scene in my father-in-law’s home on that memorable Purim day. The sheer volume of noise emanating from within that home hit me as soon as my husband opened the door. A boisterous group of yeshiva boys coming up the steps behind us preventing me from bolting, so I was forced to cover my ears and enter. My normally refined and somewhat shy husband let out a bellow of recognition as he spotted some familiar faces among the mass of humanity crowded into my in-laws’ modest dining room and was quickly swept into the crowd. That left me standing in the hallway, bewildered, astonished, and sporting a sudden massive headache. It seemed as if my father-in-law’s entire yeshiva was in attendance, and each student was engaged in some form of “Simchas Purim”. Some were dancing in small circles, tripping on their own feet or stumbling over their hapless friends who hadn’t been fortunate enough to regain their balance. Others stood on chairs, tabletops and couches, belting out songs, speeches, and sometimes unintelligible combinations of the two. And in the midst of it all, my father-in-law reigned, clearly under the influence of alcohol. He circled the room, dancing with this group, hugging that student, and delivering brochos left and right, in a booming voice I had never heard him use. By now, my husband was part of the fray, dancing with carefree abandon, his face beet red and his shirttails, which never saw the light of day year-round, now unencumbered from the confines of his belt, flapping carelessly. He looked nothing like the man I thought I’d married, and this scene was like nothing I’d ever encountered in my life. Attempting to escape what my shocked senses could only perceive as drunken revelry, and at the same time prove my worth as a daughter-in-law, I headed into the kitchen to see if I could be of service. If I thought the scene there would be more reminiscent of home, I was in for a surprise. To see the rest of this story, click "Subscribe" at the bottom of this page. Okay, we never thought that he actually slept there, that he gave the store’s address to people to send him mail or to come visit him there. Still, we always felt that that is where he was throughout the work day. Indeed, that is still the meaning of the term mashgiach temidi at some eating establishments and caterers. There still are kashrus agencies which require a man to stay full time in an eatery that is under their certification. But the times certainly are changing — oh, boy, are they. My phone rang and the speaker was extremely irate. I could hardly put the phone to my ear. What had happened was that he had gone for dinner to a Boro Park meat restaurant. In the midst of his meal he observed an obviously Jewish man leaving the kitchen, putting on his coat and leaving. Our friend’s seat faced the tiny kitchen and he could see clearly that no mashgaich/shomer Shabbos was still inside. Spotting no other Jewish worker in the restaurant, our friend was quite certain that the restaurant’s only protector of kashrus was leaving for the night. No one would be left to preserve kosher standards for those still dining. He asked a waiter who the man was who had just left from the kitchen and the restaurant. He was told that he was the owner. Armed with a cell phone, our friend called the rav hamachshir of the restaurant, a well-known rav who has many kosher certifications under his control. The rav assured him that he personally trusted the owner and that is why there was no regular mashgiach in the restaurant, although he did send a mashgiach once or twice a week to check up on things. Dumbfounded, the caller pointed out to the rav that every menu in the store clearly stated the claim: “MASHGIACH TEMIDI On Premises.” The rav told him that he knew nothing about the menu, but, as far as kashrus is concerned, he trusted the owner completely. Twenty minutes later the owner returned to the restaurant and our friend approached him. The owner asserted, that he had been in the basement all that time. More likely, he had been reached by the rav hamachsir and told to return, at least until a certain troublemaker left. I thought to myself: At first there were no hashgachos on Brooklyn restaurants. You didn’t need them, we had reasoned. Products made in non-Jewish factories needed to have a hashgacha, not restaurants or catering facilities owned by religious Jews, people who were well-respected in the community for decades. Then, after some major disappointments, the public demanded of kashrus agencies to certify restaurants and caterers and to put in mashgichim, not to rely totally on the trustworthiness of the frum owners. Now, the owner is the mashgiach temidi for the rabbi to supervise himself. Gevalt! And the menu testifies to the loyalty of the owner to be constantly there checking on himself. In another establishment, another reader reported finding no mashgiach on the premises. The owner is not observant. Cooking and baking take place there and there is also the need to have someone for separation of challah. Who was doing it? The rav hamachshir was called and apprised that no one observant was removing the challah and lighting the fires. The rabbi thanked him and looked into the matter. The fact was that another observant Jew had been found to do these duties, but that the mashgiach had taken off for two weeks without informing his boss, the certifying rabbi. I called the rav, who, by the way, is also the rav of the first story. The rav informed me that an alternate man had actually been removing the challah and turning on the fires. I asked the rav whether he would be firing the mashgiach for taking off for two weeks without informing him and for the fact that he and the owner had arranged an alternate mashgiach without informing the rav hamachshir at all about it. No, he answered, he would not be firing the mashgiach, although he would speak to the owner about the strange behavior. Now I was totally confused. A mashgiach leaves on his own for a vacation and an alternate mashgiach is found without informing the rav hamachshir or his once or twice a week visiting mashgiach. And the mashgiach is still considered reliable? Isn’t there something wrong here? Rabbi Moshe Weiner, Kashrus Administrator for the KIC of Flatbush, has informed me that kashrus agencies and owners of Brooklyn establishments have been cutting back hours from mashgichim for some time now. That means that the term mashgiach temidi, for many establishments, no longer applies to a full time mashgiach; it means instead that the mashgiach is present only as many hours as the system will bear. In other words, you may be eating during the hours that the mashgiach temidi is not there, being too early or too late to find him. In any event, Brooklyn stores ought to start posting the hours of their mashgiach temidi. This way those who want the mashgiach temidi to be working in the store while they are there can plan their dining time accordingly. At the same time that I write these words, I can assure you that several kashrus agencies are still enforcing total mashgiach temidi control even on establishments of frum owners. The kitchen cannot open until the mashgiach arrives with the keys. And it is enforced. If the mashgiach is delayed in traffic, he may get yelled at by the owner, but no way is that kitchen opening till he arrives. To be fair to those who do not employ a mashgiach temidi, that mashgaich temidi comes at a price, a very hefty price. A full time restaurant, open from late AM to early AM the next day, can be looking at a bill close to $100,000 per year for that mashgiach temidi and for kosher certification from the kashrus agency. There are double shifts at $17/hr. plus other expenses. Not every restaurant can afford that price tag, on top of the rent which they must pay every month. And, during these years of financial strain, that $100,000 figure is becoming pretty near impossible. This problem does not allow a simple solution and certainly not a one-size-fits-all, but it does need to be addressed. The kosher consumer is entitled to have real on-site kosher supervision. The following are some suggestions and points to ponder. While they do not fit all situations, readers should consider them, whether they are in the field of kashrus or are patrons of restaurants. 1. Restaurants and caterers should offer full disclosure. If you have a real mashgiach temidi, by all means mention that in your signage or on your teudah. If you have limited times for your mashgiach, mention just what his job includes and the normal times he is in (e.g., AM, PM, or 11-2). This way, a person can decide whether he wants to eat only at an establishment with a mashgiach temidi or whether he can rely on the owner himself to fill in for the mashgiach. Also, he will know that he can expect the mashgiach to be there during the hours posted to affect bishul yisroel for Sefardim or to answer his questions. 2. See whether you can hire a working mashgiach for more time, perhaps to make him really temidi. This would make it more financially feasible for you and put more mashgiach hours on the books. The only problem with this plan is that some working mashgichim are working so hard that they cannot do any mashgiach-type work at the same time. 3. One reason that that $100,000 figure is so daunting is that, at present, there are too many restaurants open so very few can make money. If the kashrus agency demands the big sum, but the restaurants are busy, things might work out. If customers realize that your restaurant has a real mashgiach temidi, perhaps thinking patrons will flock to you. We welcome input from readers in the field or consumers as to how to improve this deteriorating situation of lessening the number of hours that the mashgiach serves.